What happens when an adventurous Miami medical student taps “Best places to watch Northern Lights in British Columbia” into the Google search engine on her laptop? Well……many blogs and websites and tourism links pop up, but in this young woman’s story, the location name that caught her interest was Dawson Creek. Meet Amanda Barnes: a 27-year old Miami medical student who is soon to be finished school and focusing on her OB/GYN specialty. I met Amanda at the Dawson Creek airport as she checked in for her Hawkair flight to Vancouver and she was more than happy to share her unique experience of traveling over 4000 miles (approximately 6400 km) to see something that many of us take for granted: the Aurora Borealis. Why Dawson Creek? It was simple, when she saw that Dawson Creek was listed as a location where the Northern Lights can be visible, she discovered that there were flights from Vancouver. Vancouver was going to be her first pit stop in Canadian adventure so it worked perfectly! “Oh, so you have friends in Vancouver?” I asked. “Yes…I mean no…I mean yes” she said with a laugh. “I did not know anyone in Vancouver when I arrived, but I did know a Torontonian who I called and asked if she knew anyone in Vancouver that I could meet up with”. At this point I might have snorted with laughter because Toronto is a long way from Vancouver and I know we Canadians are friendly but we don’t automatically know everyone and that was funny. Surprise, surprise! Her Torontonian friend DID have friends in Vancouver and of course she would introduce them to each other via long distance. Now my interest was fully piqued and I leaned against the counter to get comfortable for what was promising to be a very cool story. Amanda flew from Miami to Seattle where she boarded a train to Vancouver. I can imagine that the lush greenery of the Pacific Northwest mentally juxtaposed with the sand and surf of Miami in her minds eye would be mind-boggling. This intrepid young woman spent a few days in Vancouver and did indeed meet up with her friend of a friend and subsequently fell in love with Canada. On December 31st, Amanda boarded her Hawkair flight to Dawson Creek in search of the natural wonder Aurora Borealis (Northern Lights) also known as “Dawn of the North”. There was no guarantee that the sky would dance for her during her stay in Northern British Columbia. 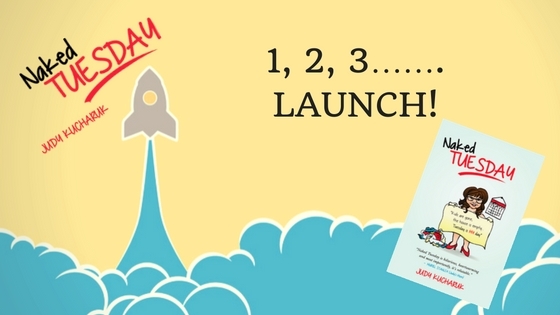 As she told her story I realized that it was her infectious joie de vivre and optimism (combined with a wee bit of adorable naiveté), which prevented her from thinking about the real possibility that her journey might be for naught. And they did dance for Amanda: a command performance. Driving 10 minutes from town, the Miami student was thrilled by the epic wonder of the aurora as the waves of light magically moved across our northern sky. Amanda showed me some of the photo’s she managed to capture on her iphone and indeed they were spectacular. “I want to move here” she said with a giggle. “Please do…..we need doctors here” and I laughed and then said more seriously, “No….really we DO need doctors here”. After Amanda boarded her flight of the first leg of a long journey home I began to reflect. What an amazing young woman, so full of enthusiasm for life. Willing to take a giant step into the unknown and revel in the wonder of what she encounters and experiences during her journey. We should all resolve to be like Amanda – wide-eyed and optimistic, manifesting goodness and gratitude. 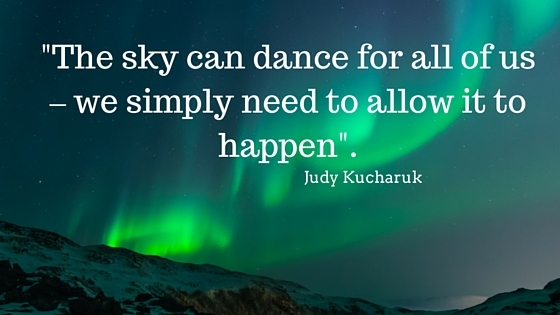 The sky can dance for all of us – we simply need to allow it to happen. The Real Housewives of Northeastern B.C. I am a sucker for a man in uniform. 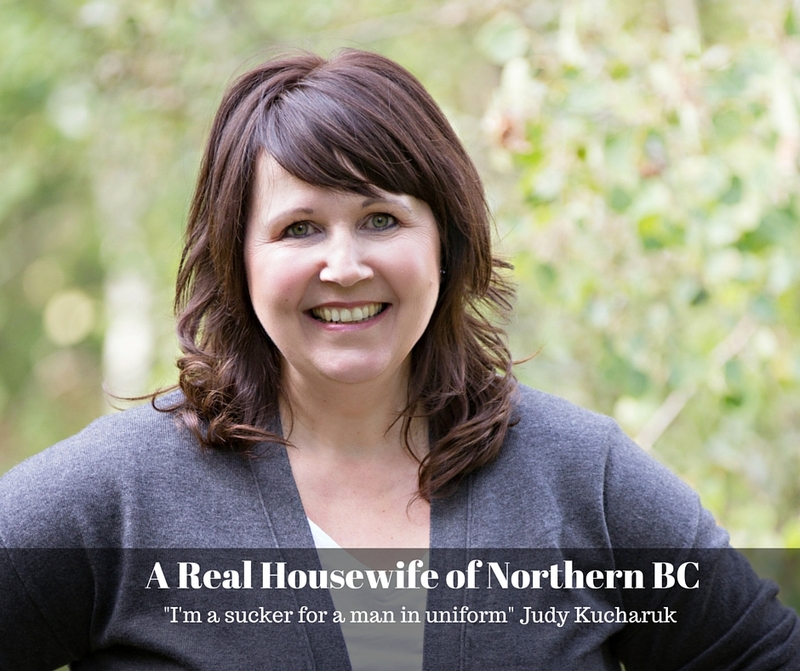 In fact many women in Northeastern British Columbia fall for men in uniform…..just not the traditional uniform. No, we fall for those clad in bright blue and yellow, high visibility, flame-retardant Nomex coveralls with the gentle scent of condensate clinging to the material. We are “Oil-Field wives”, although, in order to be truly accurate, we should be called, “Energy-Sector wives”. There are no epaulettes or highly polished footwear on these individuals in uniform….instead you will find PPE (Personal Protection Equipment) consisting of coveralls, hardhats, steel toed boots (oftentimes caked in mud), clear safety glasses and gloves. Hearing protection dangles from plastic strings and when not in use, rests against the white embroidered name badge that has been picked with a seam ripper to shorten the name. Richard becomes Rich, Robert becomes Rob, Matthew becomes Matt. Although not in the military, our hubbies and partners respond to emergencies and callouts in military fashion. A phone conversation from the alarm service is barely completed when the feet hit the bedside floor and they are making their way to work at 2:00 or 3:00 a.m. It doesn’t matter if it has snowed all night and the ice fog is so thick from cold that you can barely see the highway. It doesn’t matter that the thermometer is reading -40° and the truck tires have temporarily become square, these men and women get up and go to work. Thunk, thunk, thunk as they drive away. Sometimes we wake up as they leave and say groggily, “See Ya” and then roll over in our warm beds and go back to sleep: A bit of guilt knowing that we will get a full 8 hours of sleep whereas our partner will make do with 5 or 6 hours or even less. Some mornings we wake up and the other side of the bed is empty and cold and we know that it has been hours since someone has been there: slipping out quietly in the night to head to work taking care not to wake us. We wonder if they grabbed their lunch or had a chance to make a pot of coffee before they left. Chances are, they queued up at Tim Horton’s with a steady stream of other sleep-deprived workers, each grabbing a Double-Double and a breakfast sandwich. It will be a long day with no time to pack a lunch. I always wonder why there are some folks who insist on identifying those clad in the blue and yellow covvies (coveralls) as “rig pigs” or “oilfield trash”. My husband and my son are not trash. My friend and neighbor is not a “rig pig”. My father wasn’t trash or a “rig pig”. Many of these men and women (yes, there are more and more women all the time entering the energy sector) are hard working, intelligent individuals who can project manage and trouble shoot like a NASA scientist. Don’t laugh……have you seen what they do? Let’s just say that my inability to read a tape measure would be the least of my problems. For most contractors, a sick day is something unheard of. While employees in other job sectors are taking the day off because of a nagging sore throat, an Oilfield contractor is working through the pain. As the leaves begin to turn, I think of the long winter ahead and how difficult it can be at times. I remember the early years when our family was separated by camp life: 8 days on and 6 days off, two weeks in and two weeks out. Although the separation could be difficult at times, especially raising a young family, I believe I became a better person because I was left alone and had to make decisions on my own. I learned not to panic and to trust my instincts. I made a few bad decisions, but I also made a lot of great decisions and my husband was the first one to congratulate me when he returned from work. So cheers to our energy sector men and women in uniform! Thank you for all that you do! We appreciate your hard work. It puts gas in our vehicles and heat in our homes and food on the table. Stay Safe.